These days many sports organisations require those involved in coaching attend a range of courses designed to ensure that teaching performance (as well as personal behaviour) is of an appropriate standard. Although this may not yet be the case in darts, I reckon it’s still worth a UniBlog to take a look at just one of the general principles discussed in such courses. The principle in question, which had its origins in the world of US business management, goes by the acronym SMART. You’ll find some variability in definitions of what this actually stands for, but let’s opt for Specific, Measurable, Achievable, Realistic, Timely. As an example of how this principle might be applied to darts, I’m going to use the pathetic attempts of an anonymous Mr X to elevate the accuracy of my, sorry, his, throw from “Appalling” to merely “Bad” in just one month – and, by defining that relatively unambitious goal and limited timescale, we can already tick the “Realistic” and “Timely” boxes! Next comes “Specific”, which we’ll apply to the simple practice routine of round the board in trebles. This routine specifically tests basic accuracy rather than the more general skill of proficiency at 501, where the main focus is on preferred trebles and doubles and there’s none at all on trebles below 7. That’s fine because Mr X’s overall objective is to be a more accurate (OK, less inaccurate) thrower rather than a stronger competitive player. Why, you ask? Well, for example, maybe he’s supposed to be some sort of darts technical expert which would make incompetence at the practical reality all the more embarrassing! “Measurable” can be covered by Mr X using a smart phone, iPad, or maybe, as he’s a bit of a grumpy old luddite about such things, just a pencil and paper, to record how many darts it takes to hit each treble before moving on to the next. At this point it could even be suggested that a smart phone app could, at least in theory, be written for the Smartboard (gratuitous product placement piccy above!) to do this part of our SMART process automatically, but grumpy luddites might well think that’s just too many smarts for one’s own good! Anyway, let’s say, at the start of the “Timely” month, it takes me, sorry again, Mr X, around 180 darts to go round the board, ie an average of about 9 per treble; a hopefully “Achievable” and certainly “Specific” goal might be getting down to an average of 8 by the month’s end. Of course, to keep track of this overall statistic, it’s not actually necessary for Mr X to record the number of darts taken to hit each individual treble, just the total number used at the end of the circuit would be sufficient. But he could well find recording each treble individually more motivating and also useful in identifying weak and strong areas of the board – potentially valuable data when self-coaching. Another benefit of taking the time to record the results for each treble is that it can slow down the pace of individual practice a little, which can help maintain concentration, prevent over-casual “chucking”, and also slightly better represent the tempo of playing an opponent. 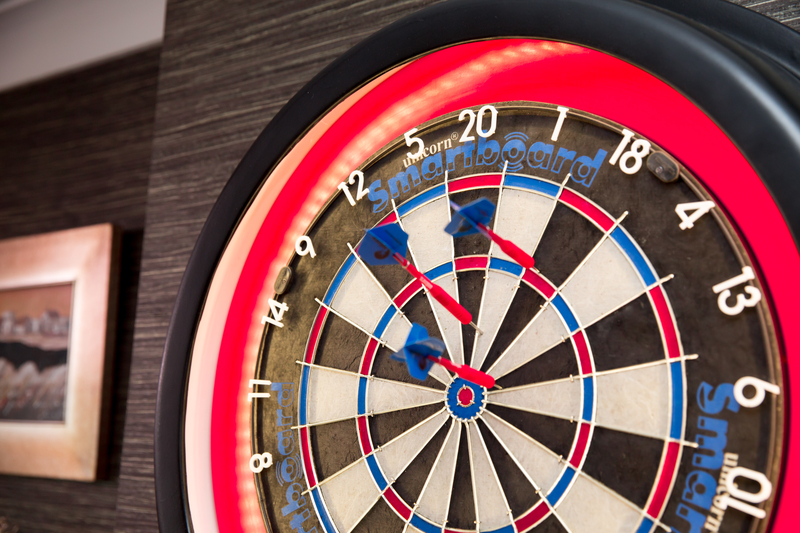 So, if you want to “get smart” about your darts, you could try applying the above type of process to your own practice routines. Good luck – Mr X reports it worked for him (nearly!). If you have any comments or questions for UniBoffin, please use the website link below.